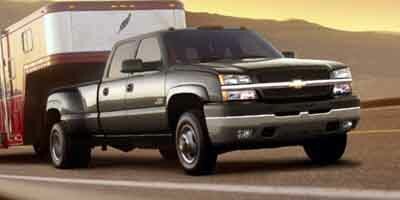 Factory equipped with an impressive engine and transmission, the 2004 Chevrolet Silverado 3500 SRW produces an impressive 0.0 city MPG / 0.0 HWY MPG. Desirable installed features include: Diesel Engine, Oversize Off-Road Tires, Four Wheel Drive, All Wheel Drive, Multi-zone Climate Control, Front Tow Hooks, Daytime Running Lights, a Transmission Overdrive Switch, a Spare Tire (Full Size), Steel Wheels, an AM/FM Stereo, Vinyl Interior, Air Conditioning, a Gasoline Engine, Cruise Control, Disc Brakes, a Pass-Through Rear Seat, Anti-Lock Brakes, a Bench Seat (Split), an Adjustable Steering Wheel, an Auxiliary Power Outlet, a Drivers Air Bag, a Locking Rear Differential, a Single-Disc CD Player, Intermittent Wipers, an Auto Headlamp, a Bench Seat, a Passenger Air Bag, a Reading Light(s), a Tilt Steering Wheel, and Power Steering. This 2004 Chevrolet Silverado 3500 SRW also comes factory equipped with: a Passenger Air Bag, a Tilt Steering Wheel, a Reading Light(s), Power Steering, and a Bench Seat. Climate Control / Multi Zone because we all have our own comfort zone, Auxiliary Power Outlet if you're looking to plug your modern 12v accessories into your dash, and a Single-Disc CD Changer to play that cool mix CD your significant other made for you,. Additional Options: Regular Production Accessory, Assist Steps, Chrome Plated Tubular, Stainless Steel. Additional Options: Regular Production Accessory, Assist Steps, Black Coated Tubular, Stainless Steel. Additional Options: Regular Production Accessory, Pickup Bed Extender, Brushed Aluminum. Additional Options: Provision For Body Mounted Warning Lamp / Instrument Panel Mounted Switch And Heavy-duty Electrical Relay With Hook-up Terminal In The Engine Compartment For A Body Upfitter To Connect A Body Mounted Warning Or Emergency Lamp. 40 Amp Nominal Rating, . Additional Options: Provision For Body Mounted Lamp With Hook-up Wiring / Instrument Panel Mounted Switch And Electrical Hook-up Wiring Behind The Cab For A Body Upfitter To Connect A Body Mounted Warning Or Emergency Lamp. 21 Amp Nominal Rating. Additional Options: Batteries, 770 Cca With A 600 Cca Auxiliary / 770 Cca Main Cranking Battery With A 600 Cca Auxiliary Battery. Auxiliary Battery Has Isolator And Is Not Wired To Ignition: Provides An Auxiliary Electrical Power Source. Additional Options: Alternator, 145 Amp / 145 Amp Alternator In Place Of The Standard 105 Amp Alternator. Additional Options: Mirrors, Outside, Convex Combination, Stainless Steel / Provides A Convex Combination Driver And Passenger Side Outside Rearview Mirror Comprised Of A 6" X 10" (15.2 Cm X 25.4 Cm) Flat Positioned Over A 6" X 6.5" (15.2 Cm X 16.5 Cm) Convex Mirror Head. Provides Drilling In Cab And Mirror Assembly Shipped Loose. For Use With Wide Body Applications Up To 96" (243.8 Cm). Additional Options: Backup Alarm / 97 Decibels Back-up Alarm. Additional Options: Mirrors, Outside Driver And Passenger Side West Coast Type / Provides Large West Coast Style Mirrors W/spring Loaded Pre-set Feature. Mirrors Are Black. Includes Cab Drillings & Mirror Assembly Shipped Loose. Additional Options: Mirrors, Camper Type, Convex Passenger Side Mirror Head / Camper Type Driver And Passenger Side Manual Black 6" X 10" (15.2 Cm X 25.4 Cm) Mirror Heads On Sail Panel Mounted Extendable Arms. Provides A Dual Segment Mirror On The Driver Side And A Full Convex Mirror On The Passenger Side. Additional Options: Mirror, Auxiliary Dual Spot Convex, Stainless Steel / Driver And Passenger Side 6" (15.2 Cm) Diameter Convex Spot Add-on Mirrors With Brackets For Use With West Coast Style Mirrors. Mirrors Shipped Loose In Vehicle.